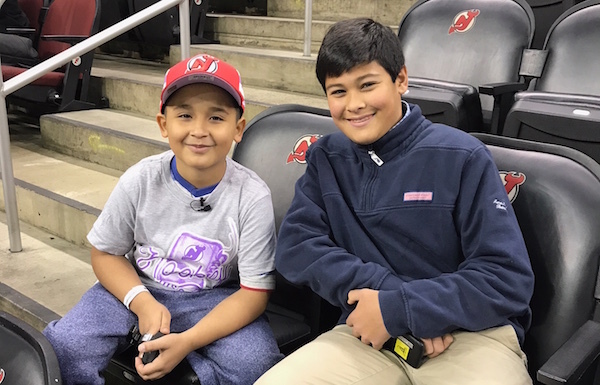 Watching the New Jersey Devils during their pregame skate at the Prudential Center a day after Thanksgiving, Abdiel Collazo had a lot to be thankful for. The eight-year-old was serving as coach for the day, alongside usual bench boss John Hynes, as part of the Devils’ Hockey Fights Cancer Awareness Night. With a whistle in hand, Collazo said that he had devised plays he planned to share with the players. Asked what he likes most about hockey, Collazo admitted he enjoys rooting for hockey’s tough guys. “I especially like the fights,” he said. Collazo knows about fighting. After all, he has spent a significant part of his life doing just that. Currently in remission from leukemia, Collazo met another survivor engaged in his own battle, center Brian Boyle, who just two months ago was diagnosed with Chronic Myeloid Leukemia. According to the CDC, one in four deaths in the United States is due to cancer. Boyle lost three grandparents to it. His father, Arthur, is also a cancer survivor. For Boyle, the NHL’s Hockey Fights Cancer Awareness Month took on a new meaning. “Now instead of just thinking about it on the day we put on the lavender jersey and tape our sticks, it’s something that has hit home with me, and I appreciate the initiative more and more,” he said. ​​Center Brian Boyle and Christopher. The league started Hockey Fights Cancer in 1998 and has raised millions of dollars for cancer research, while spreading awareness among players and fans on how important it is to help find a cure. “It’s a disease that doesn’t fight fair,” Boyle said. "[Hockey Fights Cancer] has raised a lot of funds and has done a lot of good work." Collazo agrees and felt happy to be welcomed into the hockey community. As the guest coach watched his team warm up, Boyle saw him on the bench, called him over, and handed him a puck. The Devils' game that night, against the Canucks, featured many such great scenes. Collazo and a few other brave kids were recognized before puck drop. Boyle then scored during a second-period power play to break a 1–1 tie and earn a loud ovation from the crowd. 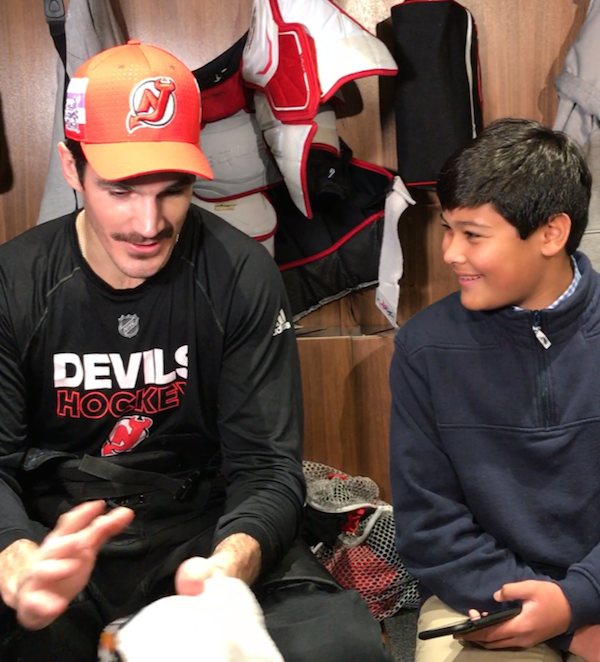 One of the best moments of the day, however, happened away from the cameras when Collazo offered the puck Boyle gave him to this Kid Reporter (who graciously declined). Maybe in him, as in Boyle, cancer really has met its match.